Many evolutionary books, including Teaching about Evolution and the Nature of Science, contrast religion/creation opinions with evolution/science facts. It is important to realize that this is a misleading contrast. Creationists often appeal to the facts of science to support their view, and evolutionists often appeal to philosophical assumptions from outside science. While creationists are often criticized for starting with a bias, evolutionists also start with a bias, as many of them admit. The debate between creation and evolution is primarily a dispute between two worldviews, with mutually incompatible underlying assumptions. This chapter takes a critical look at the definitions of science, and the roles that biases and assumptions play in the interpretations by scientists. It is a fallacy to believe that facts speak for themselves—they are always interpreted according to a framework. The framework behind the evolutionists’ interpretation is naturalism—it is assumed that things made themselves, that no divine intervention has happened, and that God has not revealed to us knowledge about the past. Evolution is a deduction from this assumption, and it is essentially the idea that things made themselves. It includes these unproven ideas: nothing gave rise to something at an alleged ‘big bang,’ non-living matter gave rise to life, single-celled organisms gave rise to many-celled organisms, invertebrates gave rise to vertebrates, ape-like creatures gave rise to man, non-intelligent and amoral matter gave rise to intelligence and morality, man’s yearnings gave rise to religions, etc. It’s not really a question of who is biased, but which bias is the correct bias with which to be biased! Actually, Teaching about Evolution admits in the dialogue on pages 22–25 that science isn’t just about facts, and it is tentative, not dogmatic. But the rest of the book is dogmatic that evolution is a fact! In practice, the ‘game’ is extended to trying to explain not just the behavior, but the origin of everything without the supernatural. Actually, evolutionists are often not consistent with their own rules against invoking an intelligent designer. For example, when archaeologists find an arrowhead, they can tell it must have been designed, even though they haven’t seen the designer. And the whole basis of the SETI program is that a signal from outer space carrying specific information must have an intelligent source. Yet the materialistic bias of many evolutionists means that they reject an intelligent source for the literally encyclopedic information carried in every living cell. To accept the probability of change and to see change as an agent of opportunity rather than as a threat is a silent message and challenge in the lesson of evolution. However, as it admits that evolution is ‘unpredictable and natural,’ and has ‘no specific direction or goal’ (p. 127), this message is incoherent. The authors of Teaching about Evolution may realize that the rank atheism of most evolutionary leaders would be repugnant to most American parents if they knew. More recently, the agnostic anti-creationist philosopher Ruse admitted, ‘Evolution as a scientific theory makes a commitment to a kind of naturalism’ but this ‘may not be a good thing to admit in a court of law.’11 Teaching about Evolution tries to sanitize evolution by claiming that it is compatible with many religions. It even recruits many religious leaders in support. One of the ‘dialogues’ portrays a teacher having much success diffusing opposition by asking the students to ask their pastor, and coming back with ‘Hey evolution is okay!’ Although the dialogues are fictional, the situation is realistic. It might surprise many people to realize that many church leaders do not believe their own book, the Bible. This plainly teaches that God created recently in six consecutive normal days, made things to reproduce ‘after their kind,’ and that death and suffering resulted from Adam’s sin. This is one reason why many Christians regard evolution as incompatible with Christianity. On page 58, Teaching about Evolution points out that many religious people believe that ‘God used evolution’ (theistic evolution). But theistic evolution teaches that God used struggle for survival and death, the ‘last enemy’ (1 Cor. 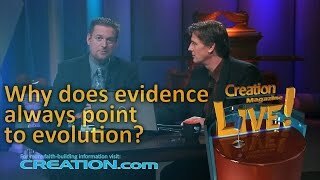 15:26) as His means of achieving a ‘very good’ (Gen. 1:31) creation.12 Biblical creationists find this objectionable [see The Fall: a cosmic catastrophe—Hugh Ross’s blunders on plant death in the Bible]. The only way to assert that evolution and ‘religion’ are compatible is to regard ‘religion’ as having nothing to do with the real world, and being just subjective. A God who ‘created’ by evolution is, for all practical purposes, indistinguishable from no God at all. Perhaps Teaching about Evolution is letting its guard down sometimes. For example, on page 11 it refers to the ‘explanation provided in Genesis … that God created everything in its present form over the course of six days,’ i.e., Genesis really does teach six-day creation of basic kinds, which contradicts evolution. Therefore, Teaching about Evolution is indeed claiming that evolution conflicts with Genesis, and thus with biblical Christianity, although they usually deny that they are attacking ‘religion.’ Teaching about Evolution often sets up straw men misrepresenting what creationists really do believe. Creationists do not claim that everything was created in exactly the same form as today’s creatures. Creationists believe in variation within a kind, which is totally different from the information-gaining variation required for particles-to-people evolution. This is discussed further in the next chapter. More blatantly, Teaching about Evolution recommends many books that are very openly atheistic, like those by Richard Dawkins (p. 131).13 On page 129 it says: ‘Statements about creation … should not be regarded as reasonable alternatives to scientific explanations for the origin and evolution of life.’ Since anything not reasonable is unreasonable, Teaching about Evolution is in effect saying that believers in creation are really unreasonable and irrational. This is hardly religiously neutral, but is regarded by many religious people as an attack. A recent survey published in the leading science journal Nature conclusively showed that the National Academy of Sciences, the producers of Teaching about Evolution, is heavily biased against God, rather than religiously unbiased.14 A survey of all 517 NAS members in biological and physical sciences resulted in just over half responding: 72.2% were overtly atheistic, 20.8% agnostic, and only 7.0% believed in a personal God. Belief in God and immortality was lowest among biologists. It is likely that those who didn’t respond were unbelievers as well, so the study probably underestimates the level of anti-God belief in the NAS. The percentage of unbelief is far higher than the percentage among U.S. scientists in general, or in the whole U.S. population. Evolutionists, including Eiseley himself, have thus abandoned the only rational justification for science. But Christians can still claim to have such a justification. 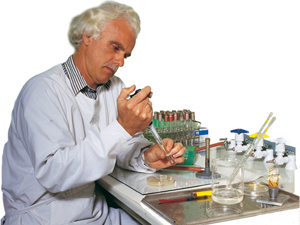 Dr Ian Macreadie, prize-winning Australian microbiologist and creationist. See interview in Creation 21(2):16–17, March–May 1999. Q: Don’t many scientists reject evolution? A: No. The scientific consensus around evolution is overwhelming … . It is regrettable that Teaching about Evolution is not really answering its own question. The actual question should be truthfully answered ‘Yes,’ even though evolution-rejecting scientists are in a minority. The explanation for the answer given would be appropriate (even if highly debatable) if the question were: ‘Is it true that there is no scientific consensus around evolution?’ But truth is not decided by majority vote! Creationists don’t pretend that any knowledge, science included, can be pursued without presuppositions (i.e., prior religious/philosophical beliefs). Creationists affirm that creation cannot ultimately be divorced from the Bible any more than evolution can ultimately be divorced from its naturalistic starting point that excludes divine creation a priori. Is nature clearer than written language? What distinguishes origins and operational science? D.M.S. Watson, Adaptation, Nature 124:233, 1929. Return to text. Boyce Rensberger, How the World Works (NY: William Morrow 1986), p. 17–18. Return to text. C. Wieland, Science: the rules of the game, Creation 11(1):47–50, December 1988–February 1989, creation.com/rules. Return to text. R.E. Dickerson, J. Molecular Evolution 34:277, 1992; Perspectives on Science and the Christian Faith 44:137–138, 1992. Return to text. D. Batten, A Who’s Who of evolutionists, Creation 20(1):32, December 1997–February 1998, How Religiously Neutral Are the Anti-Creationist Organisations?, creation.com/who. Return to text. C. Wieland,Darwin’s Real Message: Have You Missed It? Creation 14(4):16–19, September–November 1992, creation.com/ realmessage. Return to text. R. Dawkins, The Blind Watchmaker: Why the Evidence of Evolution Reveals a Universe without Design, (NY: W.W. Norton, 1986), p. 6. Return to text. E.O. Wilson, The Humanist, September/October 1982, p. 40. Return to text. J. Dunphy, A Religion for a New Age, The Humanist, Jan.–Feb. 1983, 23, 26 (emphases added), cited by Wendell R. Bird, Origin of the Species Revisited, vol. 2, p. 257. Return to text. Symposium titled The New Anti-Evolutionism (during the 1993 annual meeting of the American Association for the Advancement of Science). See C. Wieland, The Religious Nature of Evolution, Journal of Creation 8(1):3–4. Return to text. W. Gitt, W. Gitt, Did God Use Evolution? (Bielefeld, Germany: CLV, 1993); Theistic evolution questions creation.com/theistic. Return to text. For refutations of Dawkins’ books, see: J.D. Sarfati, Review of Climbing Mt Improbable, Journal of Creation 12(1):29–34, 1998, creation.com/dawkins; J.D. Sarfati, Misotheist’s Misology: Dawkins attacks Behe but digs himself into logical potholes, creation.com/dawkbehe, 13 July 2007; P. Bell, Review of The God Delusion, creation.com/delusion, Journal of Creation 21(2):28–34, 2007. Return to text. E.J. Larson and L. Witham, Leading Scientists Still Reject God, Nature 394(6691):313, 23 July 1998. The sole criterion for being classified as a ‘leading’ or ‘greater’ scientist was membership of the NAS. Return to text. Ibid., emphasis added. Return to text. S. Jaki, Science and Creation (Edinburgh and London: Scottish Academic Press, 1974). Return to text. L. Eiseley: Darwin’s Century: Evolution and the Men who Discovered It (Anchor, NY: Doubleday, 1961). Return to text. A. Lamont, 21 Great Scientists Who Believed the Bible (Australia: Creation Science Foundation, 1995), p. 120–131; H.M. Morris, Men of Science Men of God (Green Forest, AR: Master Books, 1982). Return to text. J. Mattson and Merrill Simon, The Pioneers of NMR in Magnetic Resonance in Medicine: The Story of MRI (Jericho, NY: Bar-Ilan University Press, 1996), chapter 8. See also J.D. Sarfati, Dr Damadian’s vital contribution to MRI: Nobel prize controversy returns, 21–22 October 2006, creation.com/damadian. Return to text. Standing Firm [Interview of Raymond Jones with Don Batten and Carl Wieland], Creation 21(1):20–22, December 1998–February 1999. Return to text. Prize-winning Professor Rejects Evolution: Brian Stone Speaks to Don Batten and Carl Wieland, Creation 20(4):52–53, September–November 1998. Return to text. Sidney W. Fox, The Emergence of Life: Darwinian Evolution from the Inside (NY: Basic Books, 1988), p. 46. Fox is a leading chemical evolutionist who believes life evolved from ‘proteinoid microspheres.’ Return to text. Cited 18 February 1999. Return to text. C.S. Lewis, God in the Dock (Grand Rapids, MI: Wm. B. Eerdmans Publishing Co., 1970), p. 52–53. Return to text. Ann Lamont, Ref. 19, pp. 242–251. Return to text. J.D. Sarfati, If God Created the Universe, Then Who Created God? Journal of Creation 12(1)20–22, 1998. Return to text. Some supporting information can be found in the following works, among others: G.L. Archer, Encyclopedia of Bible Difficulties (Grand Rapids, MI: Zondervan, 1982); G.H. Clark, God’s Hammer: The Bible and Its Critics (Jefferson, MD: The Trinity Foundation, 2nd ed. 1987); P. Enns, The Moody Handbook of Theology (Chicago, IL: Moody Press, 1989), chapter 18; N.L. Geisler and R.M. Brooks, When Skeptics Ask (Wheaton, IL: Victor Books, 1990); N.L. Geisler and T. R. Howe, When Critics Ask (Wheaton, IL: Victor Books, 1992); N.L. Geisler and William E. Nix, A General Introduction to the Bible (Chicago, IL: Moody, 1986); L, Strobel, The Case for Christ and The Case for Faith, Grand Rapids, MI: Zondervan, 1998 and 2001; See also creation.com/bible. Return to text.